Why Order Embroidered Aprons from University Fashions? All of our custom aprons are not listed online so if you do not see the apron style you are looking for give us a call or email us. 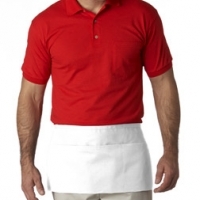 An apron is an outer protective garment that covers primarily the front of the body. It may be worn for hygienic reasons as well as in order to protect clothes from wear and tear. The apron is commonly part of the uniform of several work categories, including waitresses, nurses, and domestic workers. Many homemakers also wear them and is commonly worn as a decorative garment by women. 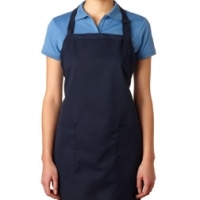 Aprons are also worn in many commercial establishments to protect workers clothes from damage, mainly bib aprons. There are many different apron styles depending on the purpose of the apron. A basic distinction is between waist aprons which cover the body from the waist down and a bib apron which also covers the upper part of the body. An apron is usually held in place by two ribbon-like strips of cloth that are tied in the back. A bib apron may either have a strap in around the neck (perhaps the most widespread use today), or shoulder straps that criss-cross in the back and attach to the waistband. The advantage of the former design is that it makes it especially simple to put on the bib apron. The advantage of the shoulder strap design is that it makes the apron more comfortable to wear; a neck strap can slightly impair ease of movement. Other types of aprons include the adjustable apron and the cobbler apron. There are also aprons that will cover the sleeves. More custom embroidered aprons will be available for purchase online in the upcoming months. Check back with us in a few months to see our new line of logo aprons including the latest monogrammed adjustable, bib, cobbler, and waist aprons.